Our Retreats Coordinator, Jorge Florez, is available to help ensure your next retreat, conference or wedding is a success. Grotonwood is a 250-acre retreat and conference center owned and operated by The American Baptist Churches of Massachusetts. We offer groups the chance to enjoy the peaceful and restorative nature of our facilities through self-directed retreats year round. We host groups from churches to social service agencies, college students, veterans groups and most other non-profit agencies. Each group comes to Grotonwood for their own unique reason related to strengthening bonds, finding peace, or working through personal and professional challenges. Our diverse lodging options allow for groups as small as 20 people or as large as 175 people. Large group lodges holding more than 40 people – or – smaller cabins that hold 14 people are among the choices. If you prefer, we can offer a formal residence for more privacy. Included are meals that accommodate the many common dietary requirements and preferences such as vegetarian, vegan, gluten free, etc. Enjoy any meal from Friday dinner to Sunday breakfast, or allow us to assemble snack trays to be waiting for your late arrival. Our retreat packages include the most popular 2-night stay with 5 meals, or a shorter visit of 1 night and 3 meals. We even offer day-only conference space. Each option is surprisingly affordable. Of course, your group can configure its own package that fits just right. While with us, make use of the chapel, gymnasium, waterfront, meeting spaces or any of the 3 to 4 miles of hiking/biking trails. For a small fee we can provide the use of presentation equipment to enhance your work. Of course, no retreat in the woods is complete without a campfire. Groups can reserve a space at one of the 3 campfire spots on the Grotonwood property. For photos and layouts of our accommodation, please view our online brochure below. Why rent a hotel ball room for a couple of hours when you can have a 200+ acre resort for the weekend? 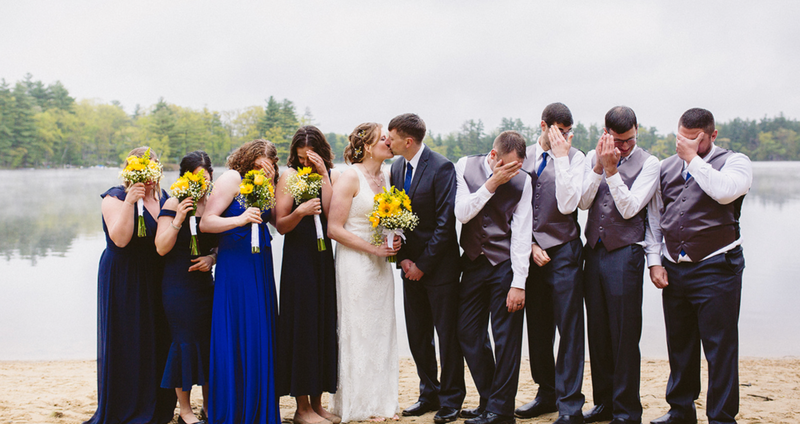 Each year we let a few couples transform camp into a truly unforgettable wedding destination. Grotonwood provides a beautiful backdrop for one of the biggest days of your life. The lake, sunsets and even snow become the scenery for many magical moments and a memorable and unique wedding weekend. Our seasoned event staff ensure that your wedding offers the perfect blend of relaxation and activities that can only be found at camp. There are a number of ceremony locations available at camp Including the log built chapel, Nutting Field, and the beach front over looking Lost Lake . There are also many locations nestled in the woods providing an intimate and rustic feel. Most of our wedding guests will enjoy their wedding reception in our Dining Hall and let our award winning chef design a menu that can cater to all tastes and budgets. There are several locations at camp that allow for the placement of large tents to provide an outdoor wedding reception if you prefer.